Listen to a ten-minute excerpt from this morning’s Annapolis Summit, which takes place annually on the opening day of the Maryland Legislative Session, on marijuana. 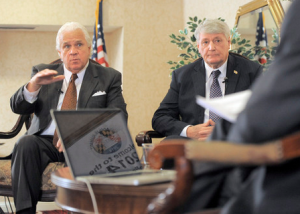 Maryland Governor Martin O’Malley, Maryland Senate President Thomas V. “Mike” Miller and Maryland House Speaker Michael Busch discuss their opinions on improving medical access, legalization and decriminalization of the drug. Hear the Governor’s comments first in response to an audience member’s question. The Senate President and House Speaker’s comments start right around the 5-minute mark.